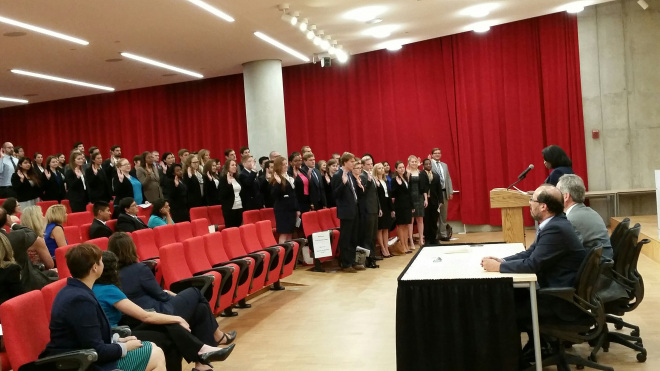 Maryland Court of Appeals Judge Shirley M. Watts delivers the oath to this semester’s 91 student-attorneys. At right are Watts, Dean Ronald Weich and clinic director Robert Rubinson. Maryland Court of Appeals Judge Shirley M. Watts officiated Tuesday, Aug. 18 at a swearing-in ceremony for this semester’s 91 student-attorneys, who will take part in the School of Law’s 10 clinics.